V3 mod pack is here with massive additions. Initially i just wanted to do a quick V2.1 that adds new enemy types but i realized it could use improvements and ended up adding 30 mods and tweaking and upgrading 70% of the existing ones. 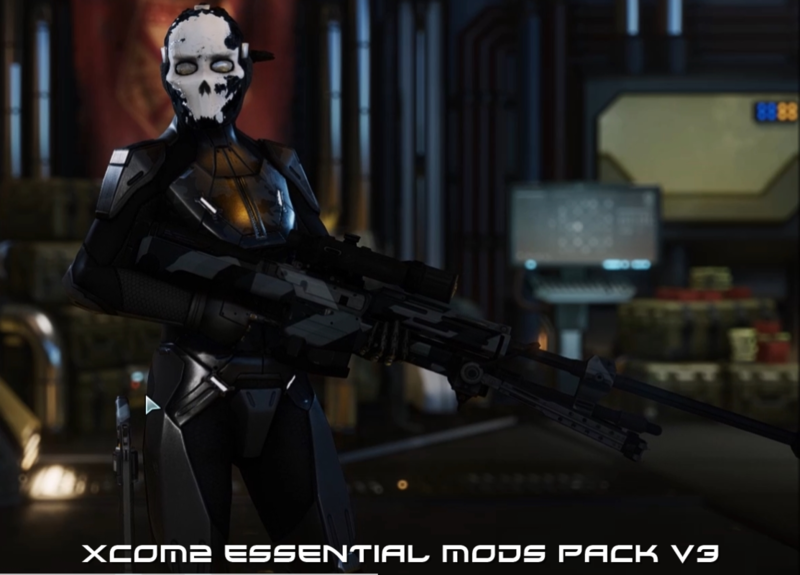 •Recommended to use this pack after you finished the game with XCOM2 vanilla,pack V1 or V2, as each is different. •Start Your Own Missions with research and resources. •Can customize soldier anytime,any rank. •some of the changes are obvious some are small much needed improvements.Here are some of the tweaks. •All secondary weapons have 1 mod slots increasing as you develop them further through research this includes the grenade launcher. •Kevlar vest : 2 mobility bonus, 1 health bonus, small dodge bonus. •Reinforced Kevlar : 0 mobility bonus, 3 health bonus, 1 armor bonus, no dodge bonus. •Gremlin Kevlar : 1 mobility bonus, 2 health bonus, 0 armor bonus, small dodge bonus,small hack bonus,very small aim bonus. •Squad screen before a mission will now show 8 slots so 8 soldiers can fit on screen. •The screen after a mission is tweaked to show interesting actions taken by your soldiers. •Color coded abilities to easy see if it ends turn or not,green is free use(doesn't cost AP),Blue uses 1 AP,and dark-yellow ends your turn. •You can see what enemy has loot and not grenade him by mistake,destroying the loot. •You can see enemies or friendly names,hp and more.I've set it so you can see only name and loot indicator but can be easily tweaked. -To tweak it go to XCOM 2\XComGame\Mods\LootIndicator\Config\XComLootIndicator.ini and change false or true to suit your play style. •If you are on fire and hunker-down your soldier will put the flames out. •AI act a little more unpredictable than before and use more abilities. •I've created a file called 1300 for you convenience so you can import them all at once or just the ones that you want. •Do i need V1 or V2 to play with V3? •I want to upgrade from V1 or V2 how do i do that? -Delete the files in the mods folder from V1 and follow installation instructions. •Is a new game required if i have V1, V2 or vanilla? •Can't i just combine V2 with this pack? -No as it contains a lot of tweaks and changes. •Will there be a V4? -I provided some save-games, back-up your Xcom folder from Documents/My Games first. •I can't complete the final mission,what gives? -I think the final mission was hard-coded to be completed with 6 soldier + the c****** (I'm not going to spoil it) so make sure to only bring 6 soldiers on the final one not 7 or 8,I've tested it 8 and it works just fine,but bringing 8 just showed two soldiers on the map after cinematic and resulting in the mission not completing. I hope you guys enjoy the new V3 pack, i think it's the best one yet adding massive changes in some areas, small changes in others and tweaks and fixes to stuff that needed it. •Optional ReShade to get rid of the gray/bloomed graphics and to add more detail to everything in the game. •Optional save-games if you just want to try out the mod-pack without affecting your current play-though. -Warning! After adding and activating mods you should never remove them as they will brake your save-game. -A part of the mods require a new game to function properly so a new game is highly recommended. -Might want to backup your other save-games if you want to revert the game to vanilla state. -Start the game from the desktop shortcut. -Your game is now in vanilla state. Got some messages of people wanting a game-save for 3.2 and I've decided to share one. 14 soldiers,each designed with a specific role. Location : The Empire of M.A.R.S. I'm thinking of "upgrading" the pack but that would require to start over and as you've said might be hard because mod authors abandoned most projects and might not work with the latest version of the game,game received a fast boom and influx of mods but then quickly died of which is quite unfortunate.Not making any promises but i might just try and have a go at it.